A direct line is my preferred route. No shilly-shallying, no roadside attractions, no stopping at rest areas unless bursting is imminent. But this trip was different. We toodled, we toddled, we stopped on a whim, knowing that we had a place to rest in San Francisco when we arrived. So stopping in Sacramento to have lunch with a colleague seemed reasonable, especially since this journalist and blogger extraordinaire is also the brother of friends Lickie and Loo. Plus, in my goal-oriented single-mindedness, I'd never stopped in "Sacto" to check out the capital of this powerhouse state to the south. We met at Spataro, preferred schmooze-spot and watering hole for movers and shakers just across the street from the Capitol itself, and walked into a room full of suits and hundred-dollar haircuts. We were seated in a booth across from the open kitchen, just two tables away from The Governator's chief of staff, who undoubtedly chose that table because the kitchen noise would cover up any confidential disclosures. Still stuffed from dinner the night before, not to mention our big B&B breakfast, Dave and I both opted for the lunch special salad, a light plate of arugula with tuna, dried cranberries and nuts, while our host had his favorite, their house burger with light, crispy fries, both excellent. He then mentioned that we would be missing a pillar of Sacramento food consumption if we didn't stop on our way out of town at Corti Brothers, a gourmet food and wine emporium that has been in business since 1947. So after lunch we drove to an obscure strip mall and found what looked like a grocery store from the 70s, rickety carts and all, and entered this shrine of imported goodness. What did we find there? 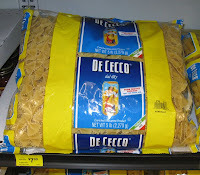 Just the biggest selection of imported goods I've seen, from salamis and cheeses to olive oils, pastas (including five-pound bags of De Cecco pastas for...gasp...$7.99!) and canned goods. Several kinds of Spanish paella rices? Check. Four brands of anchovy-stuffed olives? Duh! And don't even get me started on the wine selection, from $200 Burgundies sitting right there on the shelf, not sequestered behind barred, theft-proof cases, to $4.99 slurpers to have with your pizza. Plus a decent selection of beers and (I love California for this) hard alcohol to go with the olives mentioned above. Oh, and those Coit Tower souvenir keychains you were going to bring back to your friends and family? Buy them something from here instead and you'll get a sincere thank-you instead of that pasted-on smile that says, "Whaaaaa...???" 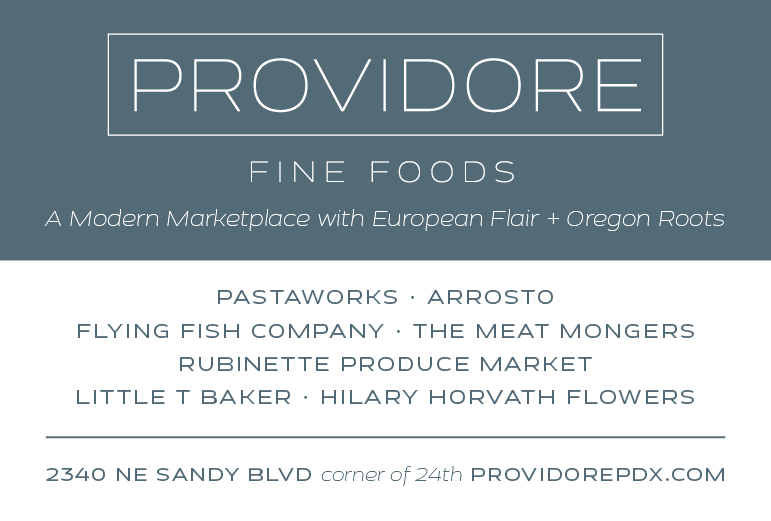 Details: Corti Brothers, 5810 Folsom Blvd., Sacramento, CA. Phone 916-736-3814. 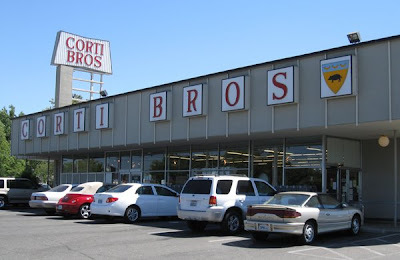 Update (thanks, Glassylady): On their website Corti Bros. notes: "After 38 years of operation at 5810 Folsom Blvd., Corti Brothers will be moving our store. The upcoming re-location of Corti Brothers brick and mortar operations in October of 2008 will not affect our internet and mail order customers." So if you plan to visit, call ahead or check the website for their current status. Late-breaking news: Glassylady now sends word that in an article in the Sacramento Bee, Corti Bros. rival Good Eats, who was to have taken over the site, has backed out of the deal in response to public uproar over the potential loss of Corti Bros. Stay tuned! Read the other posts in this series: Getting There, Paying Our Respects, Resting in Redding, Schmoozing in Sacto, Home Away from Home, Off on the Right Foot, Choosing Chinese, The Ferry and the Hog, The Point of It All, and The Last Meal. My brother, bless his heart, is one of the greatest guys I know. Generous to a fault, he loves the good things in life and enjoys them, high and low. Why, then, when he's in Redding, he chooses to stay in a run-down 50s motel called the Stardust that features stained mattresses, worn sheets and cigarette burns in the carpet, is beyond me. On the other hand, it is cheap, has a great retro-style neon sign, a (small) pool and for a modest fee allows dogs in most rooms, but I just couldn't face it this trip. 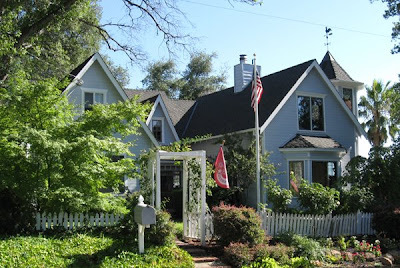 Redding is a town not known for its gracious hotels, so doing a little research online turned up some options on the B&B front. A couple of calls later I'd talked with the proprietors of Bridgehouse Bed & Breakfast and Apples River House, two spots that appealed because they didn't have that tea-and-antimacassar feeling so common in B&Bs. But they were booked, so I tried Tiffany House Bed and Breakfast, one that would score a 10 on the Victorian scale, but my worst fears were allayed by host Brady Stewart's unfussy, charming manner and the fact that the house overlooked Santiago Calatrava's Sundial Bridge. Brady said they also had a large room available featuring a clawfoot tub at one end, and that we'd have access to their large deck and pool. His wife, Susan, a wonderful host with a wickedly lovely sense of humor, greeted us and took us on a brief tour of the historic house filled with her family's antique photos, handwork and even some dresses, and then we joined them on the deck for a glass of wine before heading to Jack's. After that awesome dinner we collapsed in bed, barely waking up in time for breakfast the next morning in the airy dining room. It got off to a promising start with mugs of strong coffee and little bowls of fresh berries and sweetened yogurt with Susan's homemade bran muffins, followed by a zucchini frittata with sausage slices in a balsamic reduction, all made Dave-safe and delicious. Well-rested, fed and caffeinated, we hit the highway for our next adventure in Sacramento. 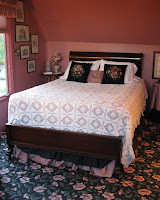 Details: Tiffany House Bed and Breakfast, 1510 Barbara Rd., Redding, CA. Phone 530-244-3225. Read the other posts in this series: Getting There, Paying Our Respects, Schmoozing in Sacto, Home Away from Home, Off on the Right Foot, Choosing Chinese, The Ferry and the Hog, The Point of It All, and The Last Meal. Everyone has their touchstones, places they return to again and again, whether it's the house they grew up in, a lake in the mountains where the dock was long and the water cold, or maybe a romantic spot where love first blossomed. 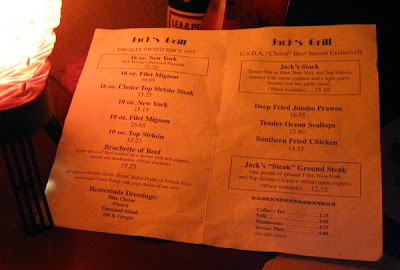 One of those places for us is Jack's Grill in Redding, an old-line steakhouse from the era when a steak dinner was not a prissified affair with balsamic reductions, wilted arugula or, heaven forfend, "ambience." A simple room in a small stucco building downtown, it was originally a second-hand store, befitting its working-class attitude. A bar where strong drinks are served as you wait for your table runs halfway down the right-hand wall, the thirty-year-old ice machine sits squatly at the end and the bartender has been there almost as long. Fewer than twenty tables serve the crowds that come here most nights, but early in the week as it was on this trip, we had our choice of even the sacred booths that line the walls. Classics are the strong suit here, and we always have martinis while we wait in the dimness, and as soon as we'd drained them the hostess ushered us to our booth in the corner. The only part of the menu you need to look at is on the left, where the steaks are listed in order of size. We've heard people say the prawns and chicken are good, too, but that's just so much blather in a place as dedicated to the appreciation of the holy bovine as this is. The only other decision after specifying the level of doneness of your meat is to choose your starch, whether garlic bread, French fries or baked potato with the obligatory butter, sour cream and chives. And each one comes with a side salad that is mixed tableside in a (usually) chipped plastic salad bowl with one of four house-made dressings. 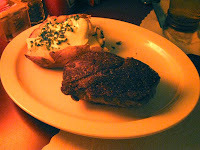 Steaks here are fried, not grilled, and my brother (another devotée and the one who turned us on to this jewel) says each one is first dipped in vegetable oil, then salted, peppered and thrown onto the superhot flat-top to sizzle to perfection. And those steaks, oh my lord, those steaks, even for died-in-the-wool grill freaks, are so tender and delicious they'll compete with the best you've ever had. A word to the wise about Jack's wine list: While I love this place, their list is on the mediocre side, so it's worth bringing your own wine and paying the modest corkage fee, since meat this sublime deserves nothing but the best from your cellar. Our choice was an '06 Syncline syrah from Lyle, Washington, in the Columbia River Gorge, a deeply rich but not over-the-top red with lots of subtlety and spice to enhance the beefiness of our steaks. Perfect! Details: Jack's Grill, 1743 California St., Redding, CA. Phone 530-241-9705. Read the other posts in this series: Getting There, Resting in Redding, Schmoozing in Sacto, Home Away from Home, Off on the Right Foot, Choosing Chinese, The Ferry and the Hog, The Point of It All, and The Last Meal. Road trips are a journey of time and mind, where daily life is put on hold and all that's important is the journey. Months ago I heard that a major exhibition of the work of Mexican artist Frida Kahlo was coming to the Museum of Modern Art in San Francisco and, since I'm a huge fan of her work, it was not an event I was going to miss come hell or high water. Rather than jumping on an airplane and 90 minutes later landing at our destination, shuttling to a hotel, going to the museum and heading back home the next day, we decided that we needed some time out to watch the countryside whiz by, stop to eat when we felt like it and maybe visit some friends (or make new ones). Plus this way we could stop at the shrine that is Jack's Grill in Redding, have lunch with a writer friend in Sacramento and take as long as we wanted in the city before heading home again. The key was renting a car rather than hauling our old Volvo wagon down and back, so we went for a compact, high-mileage Toyota Corolla that would get over 30 miles per gallon and still allow Dave, at 6' 4", some head and leg room. 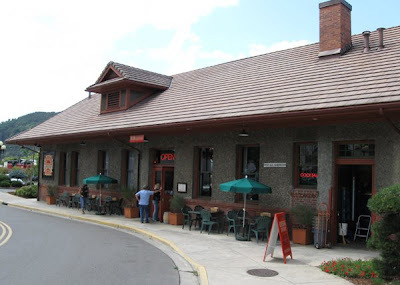 Throwing our gear into this simple 4-passenger jet, we headed out mid-morning, stopping for lunch in downtown Roseburg at McMenamin's Roseburg Station, the renovated central train station. Nothing spectacular food-wise, of course, but my spinach salad and Dave's burger were decent and allowed us a quick break before climbing up through the mountains and down to Redding. Read the other posts in this series: Paying Our Respects, Resting in Redding, Schmoozing in Sacto, Home Away from Home, Off on the Right Foot, Choosing Chinese, The Ferry and the Hog, The Point of It All, and The Last Meal. Anthony and Carol Boutard have taken care to nurture the native inhabitants of Ayers Creek Farm in Gaston, and have even changed some of their farming practices to enhance the habitat of the birds and insects they share the land with. At the center of the farm is small canyon bordered by a roughly 20-acre oak savannah. It took three years to clean out the old fencing, water heaters and machinery that were pushed over the edge with a Cat, all anchored in place by a thicket of wild blackberry. Ten years later, yanking out errant blackberry canes remains a springtime chore. But now grasses and seedling oaks are retaking the ground, providing forage and cover for songbirds and supporting prey for raptors. As the grasses and forbs increase in extent and complexity, so has the bird life. Last year, as some may remember, a pair of acorn woodpeckers arrived in June, and raised a couple young. 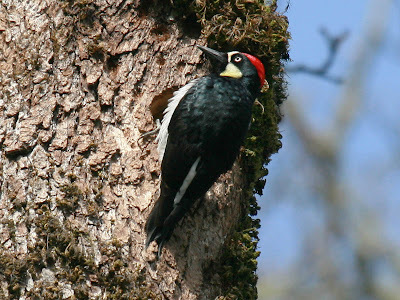 Acorn woodpeckers are communal birds, and cooperate to build granaries of acorns in dead limbs and trees. 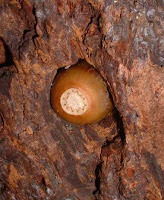 The silvery, muscular limbs and trunks of the dead oaks are now pockmarked with holes, each containing a carefully cached acorn. The trees are beginning to take on the distressed look, not so long ago the must have of the fashion industry. Last month, a reedy call announced that a new generation of acorn woodpeckers had fledged. The four adults are tending to the two young birds, demonstrating the intergenerational cooperation that makes these birds noteworthy. During the summer, the birds are mostly insectivores. Their behavior is similar to a flycatcher. They sit on a limb until an insect passes by, and then they give chase. A successful foray initiates feverish begging from the youngsters. This sit-and-chase behavior is called "hawking," and is also practiced year-round by the Lewis's woodpecker. Last year, being the year of the woodpecker here, a Lewis's woodpecker showed up in December. With its deep green back, and its stunning dark rose breast, it was a welcome visitor. The poor dear really wanted to stay, and excavated a nest cavity. When its oneness became too much to overcome, it left, probably back to the Gorge where the species normally resides. Starlings promptly grabbed the new digs. The Lewis's was in an area outside of the acorn's territory, so it was left alone. A pileated woodpecker showed up a couple of times in the heart of the acorn's territory, and retreated after an hour or so of their fury. They defend their granaries aggressively against potential thieves, and even immature acorn woodpeckers are not allowed near the food stores. With the acorn woodpeckers, there is a constant conversation among the group. During the day it is a "kweck" call that probably gives the bird's location. The tempo and frequency varies a bit, indicating other information is being conveyed. Their call changes sharply to an alarm when a hawk is nearby. They ignore the long-eared owls the occupy the same territory. There is also a separate call to action when a potential thief, such as a jay, starling or a pileated woodpecker, is nearby. Towards dusk the family carries on a comforting, almost melodic, goodnight conversation back and forth that lasts almost 30 minutes. Kind of a cozy, avian Walton family moment. Top photo by Greg Gillson. Photo, lower left, from Wikipedia. I've said it before, I'll say it again: I love Mark Bittman's approach to food. It's not fussy, it's not complicated, it's not full of the smoke-and-mirrors stuff you see in books and on TV where celebrity chefs are more about impressing you with their huge egos than teaching you how to cook great food. So this post on his blog caught my eye in a big way, and you can bet this jam is going to be appearing on a pantry shelf near us in the very near future. Plus you can watch the video to see how the man himself does it! Combine all ingredients in a heavy medium saucepan. Bring to a boil over medium heat, stirring often. 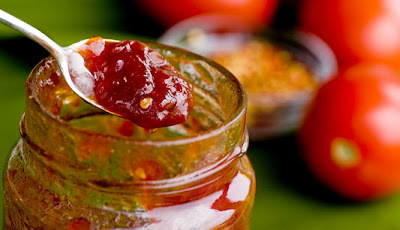 Reduce heat and simmer, stirring occasionally, until mixture has consistency of thick jam, about 1 hour 15 minutes. Taste and adjust seasoning, then cool and refrigerate until ready to use; this will keep at least a week. I was walking by the Viridian Farms stall at the Portland Farmers' Market when I saw them. Those little brown boxes filled to the brim with my favorite snack food of all time, Pimientos de Padron, begging to be sautéed in a little olive oil till they blister and then tossed onto a platter and sprinkled with salt. Pick them up by their sturdy stems, pop them in your mouth...so delicious, so delightful! 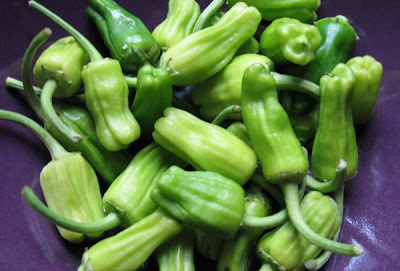 Details: Pimientos de Padron. Available at the Viridian Farms stand at the Portland Farmers' Market at PSU Saturdays from 8:30 am till 2 pm, and at the South Park Blocks market on Wednesdays from 10 am until 2 pm. This week's Market Watch travels to McMinnville and finds a thriving local market with vendors selling everything from produce to poultry and eggs to crafts and even handmade furniture. Smack dab in the middle of "Mac's" bustling downtown, this Thursday afternoon market would make the perfect stop on the way to a long weekend at the beach, or a field trip when you just gotta get out of town for an afternoon. Details: McMinnville Farmers' Market. Thursdays, 1:30-6:30 pm. Cowls St. between Second and Third in McMinnville. In Part 1, Anthony informed us about the difference between Fabaceae, Vicia, Vigna and Phaseolus. Part 2 gives us the skinny on shell, wax and bush beans, plus a long-kept secret recipe for dried favas. Shell or dry beans. These are beans grown for their seeds, rather than the pod. That is, they are grown to be shelled. Typically, they are shelled when dry, and can be stored for several months. 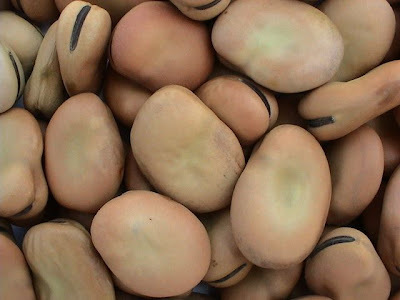 Fresh shell beans are beans that are harvested when the seed has developed and perhaps nearing maturity, but not dry. Also called "shelly beans" in some regions. Typically, green bean varieties do not make good fresh shell beans, and visa versa. Flageolet, cranberry and cannellini are examples of good fresh shell varieties. They have a tough, tasteless pod and would not be welcome as green beans. All three are acceptable as dry beans, though we prefer them fresh shells. There is also a middle point in the drying referred to as "demi-sec." Wax beans. Yellow snap or string beans. The yellow color is similar to bee's wax, hence the name. Bush bean. As the name suggests, it is a bean variety that has a bushy habit. They produce beans in a shorter time than pole beans, and the beans tend to be ready about the same time. The beans that are bush beans include: garden beans (snap, wax and string, fresh shell and dry, green and wax) and bush limas. The tepary beans do not climb, per se, but have a viney habit, sprawling across the ground. This shades the soil around the plant. The primary virtue of bush beans is that they can be harvested by machine. The machine is called a "Pixall Super Jack." Modern bush snap beans have been bred using a toughness gene that allows them to be stripped off the vine and then spewed into a big trailer where they are piled eight feet deep. A pretty impressive feat in endurance, but not necessarily a culinary virtue. We have found that even the best of the bush beans cannot hold a candle to the best of the pole beans, either in terms of flavor, or tenderness and texture. We wait patiently for the pole beans to mature. Linda Colwell kindly gave us her now-legendary interpretation. Once the favas have soaked, heat the olive oil in a deep pot. Sauté the garlic and onion with a pinch of salt. Add the turmeric, cardamom pods and Aci Sivri peppers to cook for 10 minutes slowly. Add the chopped preserved lemon, chopped tomatoes and the favas. Cook 5-8 minutes to begin simmer, add broth or water. Simmer favas over low heat and gently until favas are tender. They should be cooked in the middle but not falling apart. Finish with a seasoning of salt, stir in the olives, and chopped cilantro. * For a fast version of preserved lemon: Cut a lemon in half cross wise and slit the sides to the end of the fruit. Sprinkle liberally with kosher salt and place in freezer over night. Prior to using, thaw lemon, rinse off salt and chop. The following treatise on beans comes to us courtesy of our well-informed correspondent and Bard of Ayers Creek, Anthony Boutard. You can find him and assorted beans at the farmers' markets in Hillsdale and McMinnville. In April, our friend Laleña Dolby asked us to unravel basic bean nomenclature. As we are staggering toward bean season, this slightly didactic response might clarify some terms. What we call "beans" belong to the family Fabaceae, with two notable exceptions. Members of the Fabaceae are known colloquially as pulses or legumes. They all bear a fruit that botanists call a "pod." The pod splits into two halves, sometimes called valves. The pod has a distinct stem side and the seeds are fastened to that side. The place on the seed where it was attached to the pod is called the hilum, or the "eye." Most of the beans we eat are in the genus Phaseolus and all of these originated in the Americas. 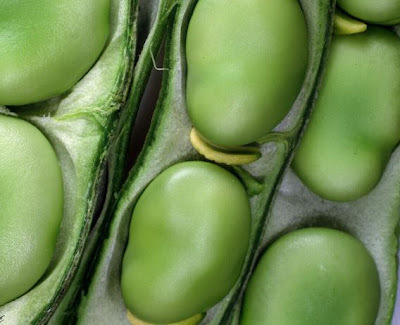 Fava beans are actually a vetch, genus Vicia, and the "yard-long" or "asparagus" beans are a species of edible podded field pea, genus Vigna, to which Mung and Adzuki beans also belong. To keep things confusing, most members of the genus Vigna are called "peas." Moreover, they are in a different genus from the English or French pea, which is a species of Pisum. These are all "Old World" types, and were brought to the Americas by settlers. There are also coffee and vanilla beans. Coffee is in the family Rubiaceae. Coffee bushes bear fleshy red berries, and inside the berries are two seeds we also call beans. There is no botanical basis for calling them beans. Vanilla beans are the fermented fruit of an orchid. It is a pod filled with seeds like the garden bean, just from a very different part of the plant kingdom. String beans. These are traditional varieties that have a "string," or tough vascular tissue, along the stem side of the pod. If you break the bean and a stringy thing dangles forth, it is a string bean. If it breaks cleanly, it is a snap bean. Some beans "snap" when they are young, and develop a string as the pod matures. Others snap until they are too tough to eat. String and snap beans belong to the common bean (Phaseolus vulgaris) species. Traditionalists believe string beans are the best flavored of the beans, but they are a lot of work because they must be picked very young, or the strings must be removed with a stringer or a paring knife. The old southern varieties like "Caseknife" and "Creasy Cutshorts" are good string beans, but take too long to mature here. Yes, we are stubborn enough to think we could sell beans that have to be stringed. You all were spared that hard sell. Runner beans. These are perennial bean plants that form a tuber and generally have a climbing habit. They are a separate species, Phaseolus coccineus, from the common green bean (P. vulgaris) which is an annual, dying after bearing fruit. The flowers or runners are large and showy, and they are often planted as ornamentals. Some are called "half runners" because the crawl rather than climb. Lima beans (P. lunatus) and tepary beans (P. acutifolius) are two other species of beans commonly eaten in the southern parts of the US. The pods of lima beans have a sharp point when they are dry, and stick into your flesh. They also pop open explosively when fully dry. We have tried growing them for five years, but unfortunately limas are poorly adapted to our climate. Pole beans. These are climbing beans that can be trained up webbing, poles or twine. The beans that climb include: garden beans (snap and string, fresh shell and dry, green and wax), pole limas and runner beans. 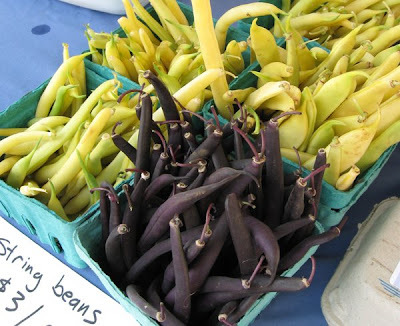 Pole beans are sought out because of their exceptional flavor and tenderness. The Willamette Valley once grew hundreds of acres of strung Blue Lake Pole beans; all had to be picked hand. (For those who delight in grammatical quirks, pole beans are strung; string beans are stringed.) Today, pole varieties have been replaced by bush beans that can be machine harvested. It should be noted that pole green and wax beans are best when they have started to develop a seed. They also benefit from long, slow cooking. Among the dry or shell beans that grow on poles are Borlotto Lamon, Tarbais, Alubia de Tolosa and Bianchetto. There are pole beans that taste like crap, but as a rule the best quality dry beans are pole types. They have a most refined flavor and a creamiest consistency. Go to Part 2. Shell, wax and bush beans, plus a secret recipe! 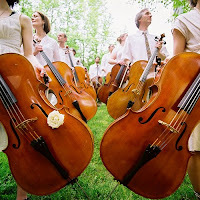 Following up on a recent rave in The Oregonian, the Portland Cello Project will bring their collaborative of up to sixteen cellists to Oregon Public Broadcasting's local radio show, Live Wire!, on August 23. GSNW's favorite cello guy, Gideon Freudmann, of CelloBop and Caravan Gogh fame as well as a founding member of the Project, describes LiveWire! as "sort of, kind of, a little bit like Prairie Home Companion, but hipper and edgier." Details: Portland Cello Project performs at LiveWire! Aug. 31, 8 pm; $15, tickets available online. The Gerding Theatre at the Armory. Phone 503-445-370. Regular reader Sarah sends us the news that Hollywood Farmers' Market regular River Rock Nursery is having a garage sale on August 23. They'll be featuring heavily discounted plants and supplies like pots, trellises and garden art plus a huge inventory reduction of their greenhouse stock. I know from personal experience that these folks have great quality plants at great prices, so the sale should be amazing! Details: River Rock Nursery Garage Sale. Sat., Aug. 22-24, 10 am-8 pm. River Rock Nursery, 19350 SE Hwy. 224, Damascus. Phone 503-658-4047. The House O' Smoke, otherwise known as Kenny & Zuke's, is continuing their tradition of Sunday Family Dinners with a "Summer in the South of France" event on August 31. Ken will be offering up dishes from his favorite cuisine like Provencal fish soup with saffron aioli croutes, Niçoise pasta with pistou, daube of beef, ratatouille and a lemon tart. If you call and it's sold out, there's another great meal coming in September with Nick preparing "Merry in Merida," a gastronomic tour of the southern-most part of Mexico. Details: Summer in the South of France at Kenny & Zuke's. Aug. 31, 6 pm; $30 ea. or $40 with wine or beer. Kenny & Zuke's, 1038 SW Stark St. Phone 503-222-3354. Parents, if your kids are picky eaters, I say go with the flow. As long as you give them the opportunity to try new and different flavors, they'll find ones they like and don't like. For instance, I never liked melons. Something about their flavor was cloying and unpleasant. When all the other kids were sucking on slices of ripe watermelon and spitting the seeds at each other, I sat at the picnic table hoping they wouldn't notice I was unarmed. Then a couple of years ago I bought two little charentais melons at the store, mostly because they were really cute, like little playground balls. In the car on the way home I noticed a heady aroma, floral and sweet, swirling around the car. Unpacking the bags, I realized it was coming from the melons, so I cut one open and tried a slice. It wouldn't qualify as an epiphany, mind you, but now I enjoy melons in all their myriad permutations, from green and citrusy to luscious and sweet. So for you long-suffering parents, there is hope for your fussy ones, as long as you can wait a few decades for their palates to mature. 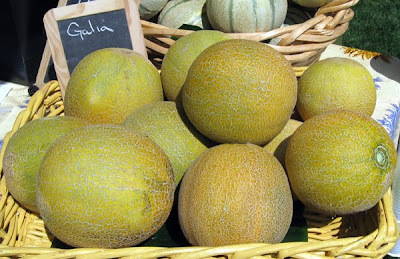 Photo of Galia melons at Ayers Creek Farm stand. 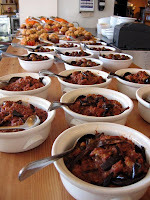 Food has always been about memories for me, tastes and smells conjuring associations with people and places. I'll never forget my grandmother's rhubarb sauce, tart and sweet all at once, the stalks cooked down into a pink puree she served in a milky-green glass bowl. And making tuna casserole always reminds me of Friday nights growing up when my mother would make a big batch of it and stand back while my brothers and I dove in, arguing over the crusty brown bits around the edges. The following is from local salt maven Jim Dixon of Real Good Food, whose stepson Daniel passed away recently from cancer. You can read about this young man's remarkable life here. Dan loved to eat, and he especially loved soul food. 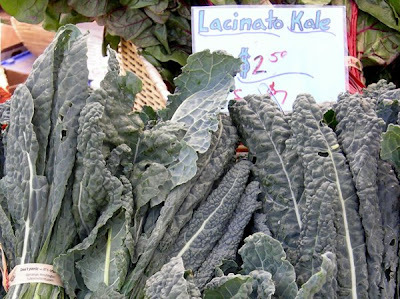 I cooked a lot of greens for him, not the traditional collards with pork, but the Tuscan soul food called cavalo nero (black cabbage, aka Lacinato kale). Wash a bunch of cavalo nero, but leave some water clinging to the leaves. Cut in chiffonade by rolling a few leaves into a tight bundle, then slicing thinly across the stem. I find this eliminates the need to cut out the stem, but go ahead if you feel so inclined. Coarsely chop an onion and sauté in a healthy splash of good olive oil for a few minutes. Be sure to toss in a generous pinch of salt, too. Add the greens, cover, and simmer for at least 25 minutes, adding more water if necessary. The cooked greens should be very tender. Serve on a platter and drizzle a little more oil over it at the table. Remembrances can be made in Daniel's name to DeLiver a Cure, an organization researching cures for fibrolamellar hepatocellular carcinoma. As regular readers know by now, my husband is a beer nut. Not the crunchy, snack-food kind but the sort who, whenever he hears about a new brewpub in town, has to call a friend and check it out immediately. And you can only imagine what he's like on trips. Forget historical sites, finding a good local restaurant or a nice little B&B. He's online making an itinerary of the breweries we simply have to visit. So when we drove to see my brother in The Dalles, he casually mentioned that on the way back we might visit Double Mountain's pub in Hood River, which wasn't open when we came back through town from our camping trip. Being the understanding person I am, I of course acquiesced to his suggestion, knowing it would make him an immeasurably happier camper. The pub is just a block or two off the town's main drag and has the feel of someone's basement rec room, with couches and beer memorabilia, plus a few cafe tables, scattered around. 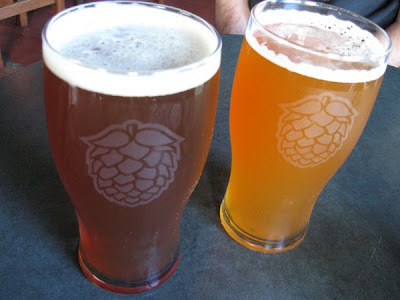 We ordered pints of their India Red Ale (IRA) and Hop Lava IPA, and both were full-bodied with a rich flavor, the Red being a bit milder and less hoppy than the IPA. A place where you could take a break driving home from a hike or from just walking through Hood River's nice little downtown shopping district, I'd probably eat someplace else, but they do serve pizzas and snacks. And, don't tell Dave I said so, but the beer really is worth stopping for. 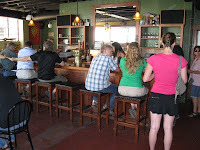 Details: Double Mountain Brewery & Taproom, 8 4th St., Hood River. Phone 541-387-0042. Perhaps Portland's most intimate farmers' market, the Lloyd Farmers' Market sits in a little park on the edge of Sullivan's Gulch between a couple of the large government offices that supply most of its customers on Tuesdays. This week's Market Watch profiles a few of its vendors and gets the skinny on what makes it tick. Details: Lloyd Farmers' Market, Tuesdays from 10 am-2 pm. On NE Holladay St. between 7th and 9th Avenues in Oregon Square. 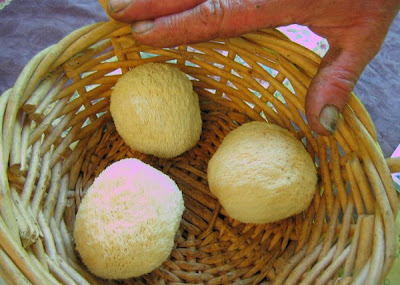 Photo: Monkey's head mushrooms at Springwater Farm. 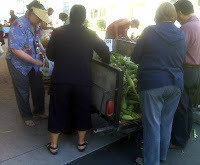 And thanks to cell-phone technology, GSNW is able to offer a live photo (at 11:30 am on 8/12) from market manager Eamon Molloy of the corn frenzy at the Greenville Farms stand. Cool! 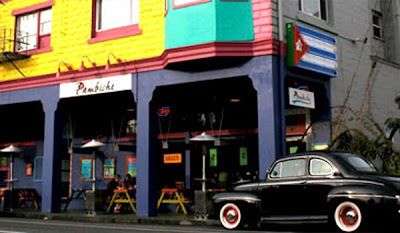 If summer is fading as fast as your hopes for getting away for a tropical vacation, get yourself over to Portland's outpost of Cuban vibes, Pambiche. You'll come away with an infusion of paradisical soul, swaying to the sounds of the trés and claves, not to mention a happy belly-full of the comidas and bebidas of this island's cuisine. The tiny restaurant is usually packed to the gills, and who wants to sit inside on a summer day anyway? So grab a seat at one of the colorful picnic tables on either side of the colonnaded walkway in front of the restaurant and take a gander at the several-page menu. Proud of its native cuisine, you'll have a hard time choosing based on the delicious descriptions. You're pretty safe, though, since I can't say I've had a bad meal here, but have enjoyed several memorable ones. For lunch the other day, my dining companion and I each ordered a fresh lemonade to sip while we pondered our options. 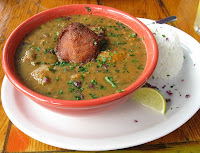 She went with the Ajiaco (pron. ah-hee-AH-coh), a "one-pot meal that comes brimming with a variety of tropical roots and vegetables, corn dumplings and Creole-seasoned pork and beef" (right), a flavorful stew of the aforementioned ingredients that has a slightly fruity undertone and a deep, rich broth. I decided on the Plato Cubano (left), a dish the menu describes as a "typical Cuban plate. 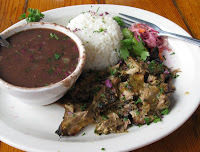 Adobo marinated roast pork, served with your choice of Cuban beans [black or red] and rice." 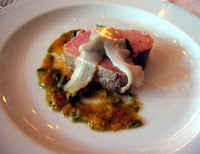 The kind of authentic, simple, well-executed food I absolutely love, the pork was tender and juicy with a salsa verde that added pungency and that south-of-the-border hit. 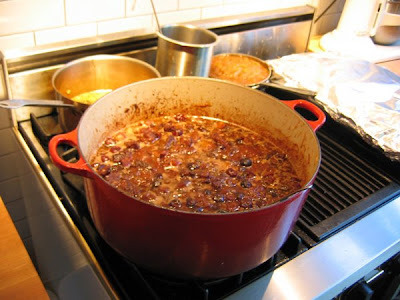 The beans were perfectly spiced with just the right mixture of Creole seasonings, giving it that mysteriously addictive quality that only a great bean dish has. With a happy hour (from 2 till 6 pm) and late hours and breakfast on the weekends, this is a spot I'd happily go any time of the day or night. And how many places can you say that about? Details: Pambiche, 2811 NE Glisan St. Phone 503-233-0511. First off, you walk in through the kitchen, like you know your host so well you come in through the back door rather than coming up the front steps and ringing the bell. Dinner sits bubbling away on the stove, bread is being sliced on the counter and an open bottle of wine is waiting to be poured. But walk past the peninsula and parted red-checked curtains at DOC on NE Alberta and suddenly you're in a sophisticated dining room with subdued lighting, black glass chandeliers and a scattering of cloth-covered tables. 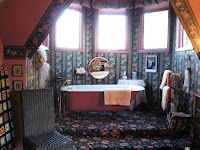 It all suggests a bourgeois bohemian sensibility, and reminds me of someone's rich parents' condo in the Pearl. 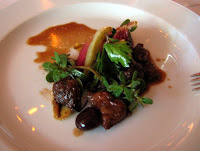 The other standout was the antipasta, essentially a salad of beef braised with bing cherries, purslane (which most people pull out of their gardens thinking it's a weed, which if it's in the wrong place it is) and torpedo onions, a type of Italian red onion. With pricing in the moderate-to-expensive range, it would be a nice place for sharing a a couple of courses with a glass of wine each, but I can't resist noting that it would be truly worth seeking out if the kitchen pushed to make the subversive layout match the food. While DOC's food is well-executed, it's not particularly unique for Portland, and I'd love to find a place that surprises diners with superb quality and simple executions of basic dishes. Like being invited to friends' homes who are superb cooks, that would be a kitchen I'd love to go to any time. Details: DOC, 5519 NE 30th Ave. 503-946-8592. One reason I love Anthony Boutard's missives from his farm in Gaston are the perspective they offer on a world that is physically close and yet so very far from our daily lives in the city. It's a rhythm tied to the seasons and the weather, not the clock and the day-timer. You can find him and Carol at the Ayers Creek Farm stall at the Hillsdale Farmers' Market on Sundays from 10 am till 2 pm and at the McMinnville Farmers' Market on Thursdays from 1:30 to 6:30 pm. Growing up, the shift to autumn was marked by Labor Day, and the end of county fair season. On the farm, the calendar is different. Last week marked that shift. Our work of the spring is coming to fruition and, at the same time, we are in the midst of the planting for the winter market. Last week, the chicories and chards were planted and are now beginning to emerge. Next week the turnips, rutabagas, winter radishes and kales will be planted. We will have over a half dozen turnip and rutabaga varieties planted this year and hope to dodge the flea beetle infestations which have been pretty strong this year. No bigger than the head of a pin, hundreds congregate on any radish or other brassica available and leave but a skeleton. The showers last night reminded us that summer has passed the apex (Who would have guessed?) and that sometimes we don't get to enjoy a long "Indian Summer." Heeding Aesop's fable of the ant and grasshopper, we are scurrying to get everything in place lest we are deprived of a leisurely autumn. 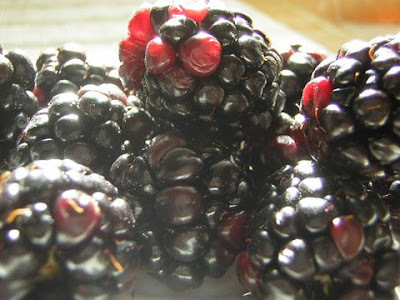 The Chester Thornless Blackberry (hereafter just "Chester") originated in 1968 at the Southern Illinois University plant breeding program at Carbondale. The original cross was done by Robert Skirvin. It is named after Professor Chester Zych, who kept the variety "SIUS 68-6-17" alive between the time the Carbondale breeding station was closed and variety was officially named in 1985. According to Skirvin, the thornless trait comes from a popular English variety called "Merton's Thornless." The English have cherished Merton since the 1930s. The plant is "semi-erect" which means it has a strong stem but still needs the support of a trellis. Chester has a very "clean" flavor, the flavor of the wild blackberry amplified. It was named the 2001 "Outstanding Fruit Cultivar Award" by the American Society for Horticultural Science. Commercial growers shy away from the Chester because it is very hard to grow well and cannot be machine harvested. The fruit is prone to UV damage and should not be picked before it is perfectly ripe. There is no doubt that the Chester is one fussy customer, but for us it has always returned the affection lavished upon it. It is a great fresh berry out of the hand, and freezes well, to boot. Our good friend, Martie Sucec, gave us this old Gourmet Magazine recipe for Blackberry Slump when we first started at the Hillsdale Farmers' Market in 2002. It is simple to make. Preheat oven to 375 degrees. Put berries in an ungreased 5 to 6-cup casserole, gratin dish, deep dish or ceramic pie plate and sprinkle evenly with about 1/2 cup of the sugar. Sift together flour, baking powder, salt, and remaining sugar into a medium bowl. Add milk and melted butter and whisk until smooth, then pour over berries (don’t worry if berries are not completely covered). Bake slump in middle of oven until top is golden, 35-45 minutes. Transfer to a rack and cool 20 minutes. Serve warm with vanilla ice cream or whipped cream. Mrs. Lloyd of Lee, Massachusetts, occassionally supplied the Boutard family with plums from her backyard tree. When those small black plums were ripe, a kuchen was dessert. Aden Gokay was a backyard orchardist from Old Chatham, New York. One late summer's Saturday, Anthony's father, Cecil, and Aden drove to Geneva for the Cornell University Fruit Day at the Agricultural Field Station and returned that evening with an impressive haul of plums, gages and other fruit. Cecil remembers Aden's Coupe de Ville (the Boutards' mighty chariot at the time was a 42 h.p. Hillman Imp) and Anthony remembers the several days of zwetschenkuchen that followed in a house usually devoid of dessert. He still loves it warm in a bowl sodden with cold milk and that, comrades, is why we grow plums. In German, zwetschen are prune plums, and pflaumen are table plums and gages. Butter a 9" x 9" pan. Preheat the oven to 375 degrees. Cream butter in mixing bowl. Beat in sugar and the egg. In a separate bowl, sift together flour, baking powder and salt, then add to the first mixture alternately with milk. Cut plums in half and place cut side up close together in even rows over batter. The plum flesh should float slightly above the batter. Sprinkle with melted butter and then sprinkle with turbino (raw) sugar, especially over the plums. Bake about 20 minutes or so until the batter is cooked. Cut into squares. 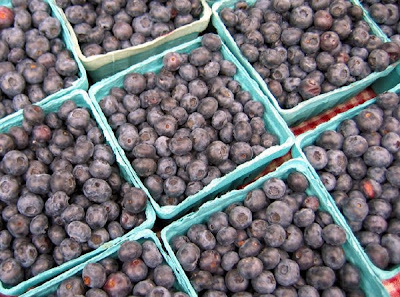 Summer finally arrived at the Milwaukie Farmers' Market this week, and folks were busy stuffing their market bags with everything from cipollini onions to cherries, blueberries and peaches. The crafts and garden booths were also bustling with activity, and Hartwell's restaurant had passers-by drooling over their berry cobbler. Details: Milwaukie Farmers' Market. Sundays from 9:30 am-2 pm in downtown Milwaukie on Main Street across from City Hall. There is nothing that says summer to me more than those luscious, perfumed orbs that we call peaches. Others might argue that it's the berries or the tomatoes that are the essence of the season and, of course, they'd be right. For themselves. 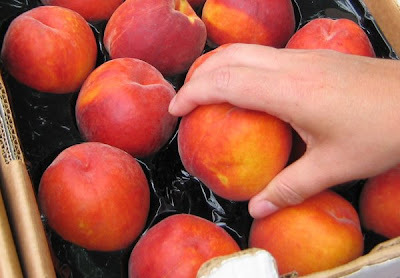 But everything about peaches, from the smooth meaty texture of the flesh to the thick juice that pours out of them from the very first bite, is the music of the season for me. The symphony I'd write would speak of warm, languid days, fruit hanging heavily on the trees and a light breeze that carries their scent to me. And tonight I'm going to sit in the back yard (or the hammock if I can get to it first) and have some fresh slices on ice cream. Summer! Photo of Sweet Sue peaches at the Milwaukie Farmers' Market. Deciding what to do for a special occasion is always fraught with indecision around here. Tradition would dictate choosing one of several high-end dining spots on the list of favorites, like Castagna or Paley's Place. Or going to one of the seemingly endless number of new restaurants that have opened and we haven't yet made it to. Then there's the temptation to grab a couple of steaks, fire up the 'cue and shake up a martini right here at home. But to take advantage of the occasion (our anniversary), we decided to go for a drink at our new favorite hangout, Bar Avignon, and think about where to have dinner. After a cocktail and their killer pate plate, we took the easy way out and simply walked across the street to Nuestra Cocina. It was a warm Friday night and packed, so there was a substantial wait for a table, but we settled in at the bar and in short order were presented with their amazing pork tacos. A plate of four of the most sumptuous tacos you'll ever hope to meet for only six bucks, these were incredible. 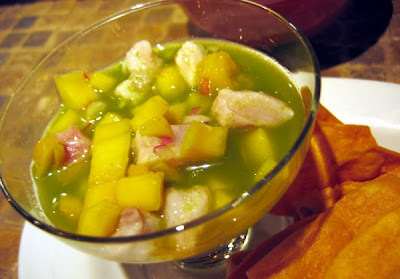 When we got our seats at the kitchen bar, we ordered the ceviche, a mindblowing mixture of mango, chile and seafood served with house-made tortilla chips that rivaled the best ceviches we had in Mexico. Not having the sense to stop there, we ordered entrees, Dave deciding on the classic (and one of the best dishes on the menu) Cochinito Pibil with my choice being the Enchiladas de Hongos, mushrooms, potato and cheese-stuffed tortillas in a light chile sauce. Both were terrific, but we were so stuffed we brought half of each one home, a windfall for Mr. B who was happy to destroy any evidence of our shortcomings. Details: Nuestra Cocina, 2135 SE Division St. Phone 503-232-2135. From Tami Parr's most excellent cheese blog, the Pacific NW Cheese Project, a note about the upcoming open house at Pat Morford's River's Edge Chevre. Rivers Edge Chevre will hold its annual Open House on Sunday, Aug. 24, from 12 until 5 pm. 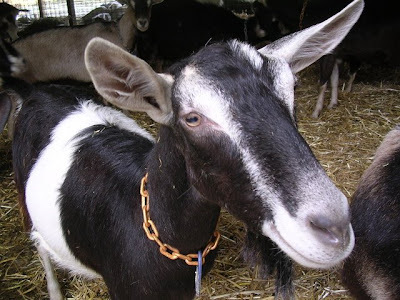 Here's a great opportunity to sample and purchase Pat Morford's beautiful, award-winning artisan goat cheeses at the farm, pet some goats and enjoy local art as well. Madrone Mountain Vineyards and Daisy Creek Vineyards will be on hand, pouring wine to accompany the cheeses, and local artist Harold Lofton of Glass Anvil Studio will also be in attendance. Last year's event was great fun and this year's fete promises to be even bigger and better! Details: For more information and directions see the Rivers Edge website. The farm is located just outside of Newport, Oregon, about 2 1/2 hours from Portland. Rivers Edge Chevre, 6315 Logsden Rd., Logsden. Phone 541-444-1362. The melons are just beginning to ripen at Ayers Creek Farm, and Anthony gives us the lowdown on the wonderfully perfumed and irresistible Charentais melons that he and Carol will have at the McMinnville Farmers' Market this Thursday and the Hillsdale market on Sunday. The Charentais, or Cavaillon melon, is a variety of rock melon, or cantaloupe. The rock melons have small fruits with distinct lobes, typically eleven or twelve, and are strongly scented. They originated in North Africa. The name "cantaloupe" is derived from "Cantalupo," or "singing wolf," location of the Papal summer residence north of Rome. The big, heavily netted melons often marketed as "cantaloupe" are actually net or musk melons, and belong to the reticulatus group of the melons. The valley around the city of Cavaillon has a melon growing tradition going back several centuries, though the "Charentais" with which the region is now strongly associated, was introduced in the 1920s. Early in its agricultural development, the Town of Gaston was known for its fine melons, but the deep muck soils of Lake Wapato also proved good for onions, an infinitely less fussy crop. The onions held on until recently, but now there is not a single onion field in the valley. We have tried growing many different melons, but none can equal the Charentais and the Galia in this climate, others fall short. Galias come next week. What makes the Charentais so distinctive is the variability in fragrance. Some are floral, others have a spicy or citrus note, yet others have a fragrance reminiscent of caramel or butterscotch. When selecting the melon, let your nose guide you. They should all be ripe, but the best one for you is the one that pleases the nose. Rock melons must be cut from the vine before the stem slips off the fruit. The red nectar where the stem was cut is a good indicator of ripeness. For us, we look at the leaf closest to the melon, and if it has stated to shrivel, the melon is ripe. 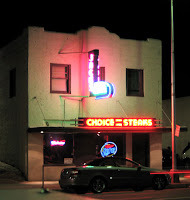 "J- & I had dinner there Saturday. Try to get their “wing” special while it’s still on the menu. Dry rubbed and sauced with amazing Indian spices coming through with hints of cinnamon, clove and plenty of heat. Served with some kinda yogurt dipping sauce. 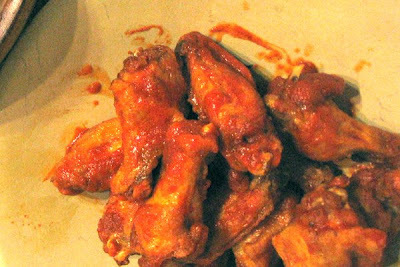 Some of the best wings I’ve ever had. To me, getting an e-mail like this is an all-points bulletin that rockets its subject to the top of my to-do list. So when I e-mailed Dave and told him we needed to meet at Vindalho that evening, he asked no questions, knowing it was a mission of the utmost importance. 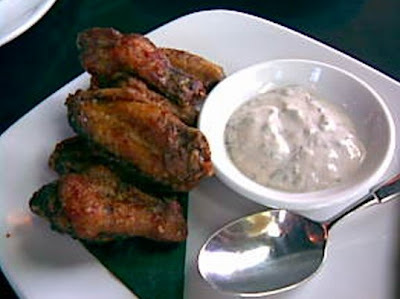 And those wings? Heavenly. Delicious. Deeply satisfying. Especially (Thank you, K-!) with a martini. And I dare you to order just one plate. Details: Vindalho, 2038 SE Clinton St. Phone 503-467-4550. I know it's a horrifying thought, but November will eventually get here. Though hopefully not until we've had the good, long Indian summer we so richly deserve after that cold, wet spring. But Chrissie Zaerpoor of Kookoolan Farms wrote to let me know that they are taking reservations now for Thanksgiving turkeys and will likely sell out in September. These are pasture-raised, free-range turkeys started as chicks on Mar. 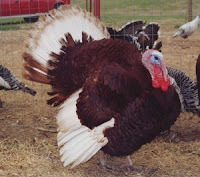 25, and this year you have the choice of a standard, broad-breasted turkey or a "Red Bourbon" heritage breed. Dave roasted one of the broad-breasted birds on the grill last year and it was so good he had to stand for several rounds of applause. Get yours now! Details: Order by e-mail and include phone number and pick-up location, either at Hillsdale Farmers Market on Sun., Nov. 23, or at the farm Mon.-Wed., Nov. 24-26. $20 deposit required; take cash or check to the market or mail it to: Kookoolan Farms, 15713 Highway 47, Yamhill, OR 97148. Phone 503-662-4742. 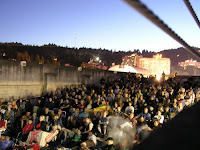 Details: Rooftop Movies at the Hotel Deluxe. Movie starts at dusk; $7. Hotel Deluxe, 729 SW 15th Ave. Phone 503-219-2094. 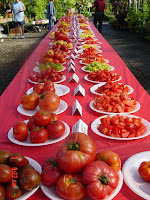 Mark your calendar now to attend Farmington Gardens annual Tomato Festival on August 30. Linda Shively, ever-on-the-ball PR person at the nursery, says that some years they have more than 100 varieties to sample, and this year will be no exception. Chef Dan Brophy will be cooking up tomato dishes to try, plus they'll have an olive oil tasting of locally-made olive oils from Red Ridge Farms in Dayton. Even more, Ambruso's Italian Ice cart will be there selling their icy treats. All free, all day long! Details: Farmington Gardens 6th Annual Tomato Festival. Aug. 30, 11 am-3 pm; free. 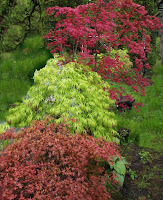 Farmington Gardens, 21815 SW Farmington Rd., Beaverton. Phone 503-649-4568.